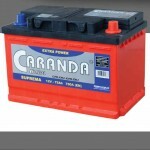 CARANDA Suprema® uses the most recent inovations in the Ca / Ca manufacturing technology that ensures the greater cold startup performance and high power required for the latest car generation that have high-energy demands, as they are equipped with many modern electronic equipment and systems. The cover is double thermo-weld and has recombination labyrinth for each cell. It provides maximum protection against electrolyte leakage even if the battery is upside down (Roll-Over-Test). These batteries are completely maintenance-free throughout their life span.